Boris Johnson has said the row over the border in Northern Ireland is being used to frustrate Brexit. The foreign secretary insisted there were "very good solutions" to avoid the need for a hard border. There is a stand-off on the issue with the EU publishing a legal draft of its Brexit withdrawal agreement. 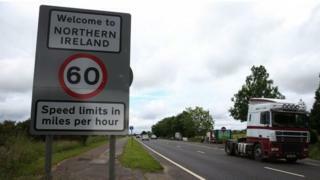 An option for Northern Ireland to follow EU rules to avoid a "hard border" - if an alternative arrangement is not agreed - has sparked a row. The Democratic Unionist Party, which offers vital support in key votes to the Tory government, says details of the draft treaty have "fundamentally breached" an agreement reached in Brussels late last year. Conservative Brexiteers say it is "completely unacceptable" and would effectively annex Northern Ireland. 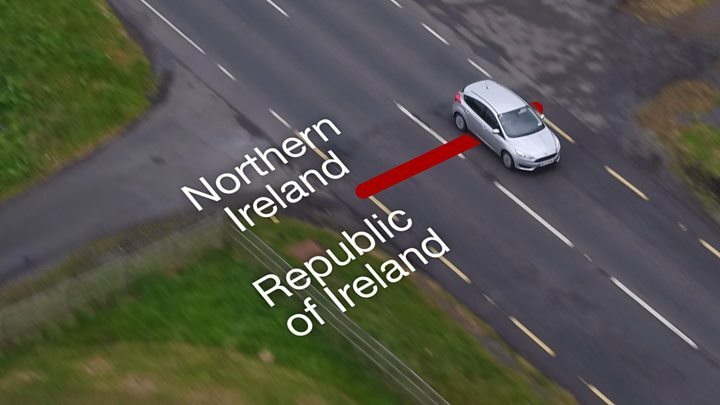 The European Union's chief negotiator, Michel Barnier, unveiling the draft agreement, described this Northern Ireland border option as a "backstop" if no other proposals are found. And a former EU commissioner said it was down to the UK to come up with a solution, warning that "at a high pace we are heading to the cliff edge". BBC assistant political editor Norman Smith said it was shaping up to become "the big Brexit bust-up" with both sides of the argument refusing to budge. Mr Johnson faced criticisism on Tuesday for suggesting in a BBC interview the issue of the border could be managed as easily as London's congestion charging zone. Speaking to Sky News on Wednesday, he said: "What is going on at the moment is that the issue of the Northern Irish border is being used quite a lot politically to try and keep the UK in the customs union - effectively the single market - so we cannot really leave the EU. That is what is going on." Media captionWill the bridge that unites the two villages be used to divide them? "If the EU or Dublin believes the UK government will be signing up to a border in the Irish Sea, they are deluded," said senior DUP member Sir Jeffrey Donaldson. Mr Donaldson argued the draft divorce treaty would also undermine the constitutional status of Northern Ireland in the Belfast Agreement. That 1998 treaty - also known as the Good Friday Agreement - between the British and Irish governments and most political parties in Northern Ireland decided how the region would be governed and brought an end to 30 years of sectarian conflict. Former Brexit minister David Jones told BBC Radio 4's Today programme the EU was proposing that Northern Ireland stay in the customs union, and subject to the jurisdiction of the European Court of Justice. "That effectively amounts to an annexure of Northern Ireland by the European Union," he said, adding: "I think that it would be pretty catastrophic and I think that the European Union in actually proposing this is behaving wholly irresponsibly." But former EU trade commissioner Karel de Gucht said: "If you have another solution then please come up with it." All of the UK's proposals so far have been "mutually incompatible", he added. And Irish Prime Minister Leo Varadkar told RTE that in order to avoid the backstop being triggered, "it is up to the UK to bring proposals to the table to make that possible". He added: "It's not OK for people, whether pro-Brexit politicians in Britain, people or parties in Northern Ireland, to just say 'no' now." The draft document aims to encapsulate - in legally binding language - agreements already reached on Ireland, citizens' rights and the UK's so-called "divorce bill". It mandates that during the Brexit transition, which it says should last only until the end of 2020, the UK must continue to comply with all existing EU legislation. It would however lose all voting rights and decision-making power, including on any rules adopted by the 27 remaining member states. EU negotiator Michel Barnier has said the document will not contain any surprises because it translates the political pledges made by both sides in the talks so far. "The clock is ticking; time is short," Mr Barnier said at a news conference on Tuesday. "I am concerned." Theresa May wants trade to be frictionless across the Irish border after Brexit. But there is plenty of political friction as every potential solution seems to bring a new problem. 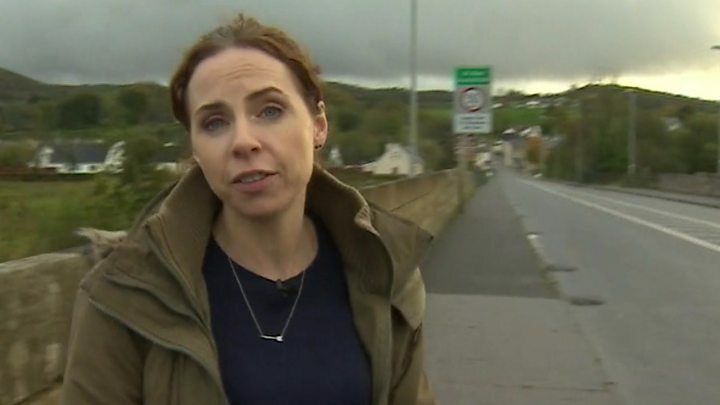 In a leaked letter designed to demonstrate that there would be no need for new infrastructure between Northern Ireland and the Republic, Boris Johnson used a potentially toxic phrase: "even IF there is a hard border". This allowed critics to suggest that a regime of border checks which would be anathema to republicans, nationalists and the Irish government was being contemplated. Downing Street swiftly reiterated its commitment to no hard border. But one of the solutions - indeed, the most detailed option - being put forward by the EU would keep Northern Ireland aligned with EU regulations. The DUP's Jeffrey Donaldson has said the government cannot sign up to what would in effect be a border in the Irish Sea. And with rebellions threatened by some of her own backbenchers, Mrs May is likely to need the DUP's MPs to deliver the Brexit she's promising. The prime minister's office has categorically dismissed any prospect of a return to a "hard border" in Ireland as a consequence of Brexit. The statement on Tuesday evening followed the leak of a letter to the prime minister from Mr Johnson, in which he appeared to contemplate the possibility of future customs border checks, after the UK, including Northern Ireland leaves the EU customs union. The leaked letter, obtained by Sky News, quoted Mr Johnson telling the prime minister the return of a hard border on the island of Ireland would continue to leave 95% of traffic to pass unchecked. Following the letter's emergence, Labour called for Mr Johnson - one of the leading Brexiteers in the cabinet - to be dismissed "before he can do any more damage". A spokesman for Mr Johnson said the letter was "designed to outline how a highly facilitated border would work and help to make a successful Brexit". "It shows how we could manage a border without infrastructure or related checks and controls while protecting UK, Northern Ireland, Irish and EU interests."